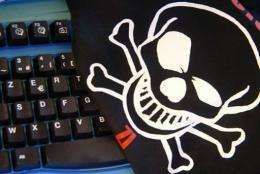 The Austrian branch of the hacker group Anonymous accessed the bank data of 96,000 people in an attack on the website of the country's GIS television licence agency, officials said. The Austrian branch of the hacker group Anonymous accessed the bank data of 96,000 people in an attack on the website of the country's GIS television licence agency, officials said on Monday. The hacker group, which was targeted last week by US authorities in a crackdown that included 16 arrests, managed to access 214,000 records with personal data during an attack on Friday. Banking data of 96,000 people was among these records on the GIS server. "We have already started to inform all the clients concerned personally and advise them to monitor especially closely all their bank account movements," GIS spokesman Herbert Denk said. The federal security and counter-terrorism bureau (BVT) was investigating the attack and planned to file a complaint against unknown persons, GIS added. The Anonymous hackers had also recently attacked the websites of Austria's far-right Freedom Party and the Social-Democrats of Chancellor Werner Faymann. This sort of activity from within anonymous is strange. They're supposed to be 'hacktivists' not criminals. However, if i were an organized crime gang i wouldn't think twice about claiming to be part of the collective just to thwart the investigation. @lovenugget anonymous isn't really a group with leadership or cells, its just any person online acting on their own behalf that tells other people on anonymous what they are doing. Hence why the group is called anonymous, because they are. I think it's pretty clear Anonymous are really just neo-anarchists. Activists hope and believe they're going to accomplish a defined ends, these guys are pretty much just anti-establishment terrorists and now apparently crooks. Wow, I actually get to use this term in the correct context... I've been waiting years for this! you realise that antidisestablishmentarianism is a double negative right? That being said, antidiestablishmentarianism is people against change.... ie the government. Disestablishmentarianism is a fancy word for anti-governing sentiment (not anti-government, anti governing body.... eg. Church, State, Monarch, General, etc.) to be antidisestablishmentarianist you are pro-governing... I am not a sheeple, so no antidisestablishmentarianism for me. of course I realise, that's why I was so happy to be able to use the term! Given that the previous comment had stated that anonymous were "anti-establishment", then anti-anonymous comments could be considered to be made by antidisestablishmentarianists! Or... Antidisestablishmentists. I prefer the longer version with the needless additions of course. I wonder if this is just a case of a bank getting hacked and their Managers saying "Oh it must have been anonymous!" without even talking to their IT department (if they even have one). Honestly if companies can't spend the relatively small extra cash to protect their clients why should we trust them with our money? Why aren't they being partially prosecuted for the loss? If a Hospital looses your records and there is a chance that someone else saw them, it does not matter if it is the fault of the Hospital or Some Hacker, the Hospital is liable not only for whatever financial harm comes to those Patients, but for Penalties that are up to 5000$ USD PER record. Why isn't my bank liable if they can't be bothered to have proper security?